With summer coming to a close, it’s time to get ready for the fall’s new art offerings around the city. And what better way to do that than by catching up with friends, new and old, to talk shop and find out what’s going on? That’s exactly what some of Artblog’s freelancers, editors, and friends did last week at the Writer’s Meet and Greet. 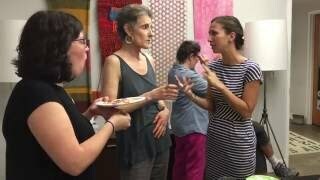 Held at Culture Works on September 9, 2016, the Meet and Greet introduced some of Artblog’s dispersed freelancers to each other for the first time. Check out the video of Artblog’s Meet and Greet here and make sure to stop by for the next one!  Previous Don't-miss events at ICA, Philly Free Streets frees some streets, Congratulations Artblog, #38, Dirty Franks wants your art, Plus, Artblog+St. Claire want your writings and thoughts!